'Bim and Dogsbody' two characters created by Joan and Ron and performed by Joan in a satirical series she wrote for Granada Television. 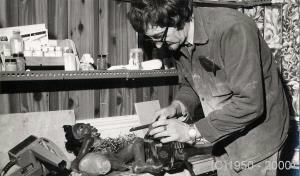 Ron carving one of our early marionettes for Cabaret. 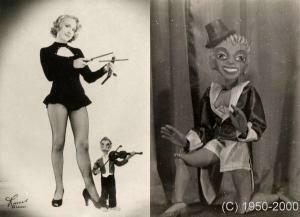 Ann in Variety and a popular tapdancing marionette. 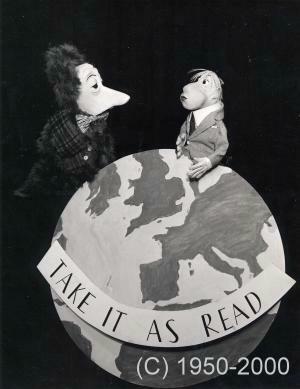 The Field Puppet Company performed before Prince Charles and Princess Anne with their marionettes. We also entertained in stately homes and for stars such as Lauren Bacall, Peter Sellers, Humphrey Lyttleton and Kenneth More. Thousands of children enjoyed our marionette musicals staged on a grand scale in the Arcade Theatre in Blackpool, The Spa, Scarborough and at venues in Bognor, Clacton and Southsea. As a child I helped with these shows. Nicky and Charlie and their circus friends toured with a portable stage and taught hundreds of London school children road safety. I first performed a 15 minute marionette act at Eastbourne's Hippodrome theatre and appeared in Variety sometimes on the same bill as Morecambe and Wise, Alma Cogan, Hylda Baker and even Max Miller, who came off the stage after his act and said "What's all this then gal?" He watched my act the next night. We appeared in New Faces, TV programmes for the partially deaf and in Cliff Richard's Saturday Spectacular. 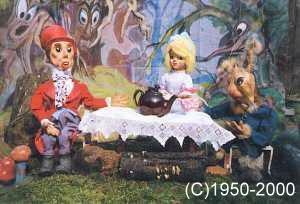 In the 60s we made the marionettes and performed for the film "Oh What a Lovely War" on Brighton's West Pier and we were very involved in "The Telegoons" the TV puppet version of the Goon Show. We made pilot films for TV in the 70s but, despite my mother writing and performing some satire for Granada, we never became household names. Finally, my father retired from puppetry and opened a successful art gallery in Bloomsbury and later helped to set up the Brunel museum in Rotherhithe. Meanwhile my mother became the Principal of the Royal School of Needlework. My mother I conserved the marionettes that had been abandoned in lofts and garages. We spent happy hours working together and filming them. Some of the films won awards in film competitions. She become very frail but still wrote new scripts and had fresh ideas. Unfortunately after a brief illness, she died. Now in Brighton I am back to painting, poetry and performing some standup comedy. 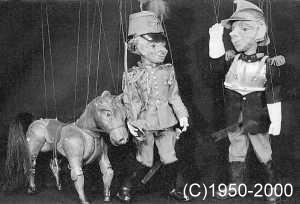 The marionettes are tiny works of art and currently languish in storage. If a museum, the owner of stately home or a charitable institution feels that they have space for permanent or temporary displays, please contact me. ann@puppethouse.co.uk.